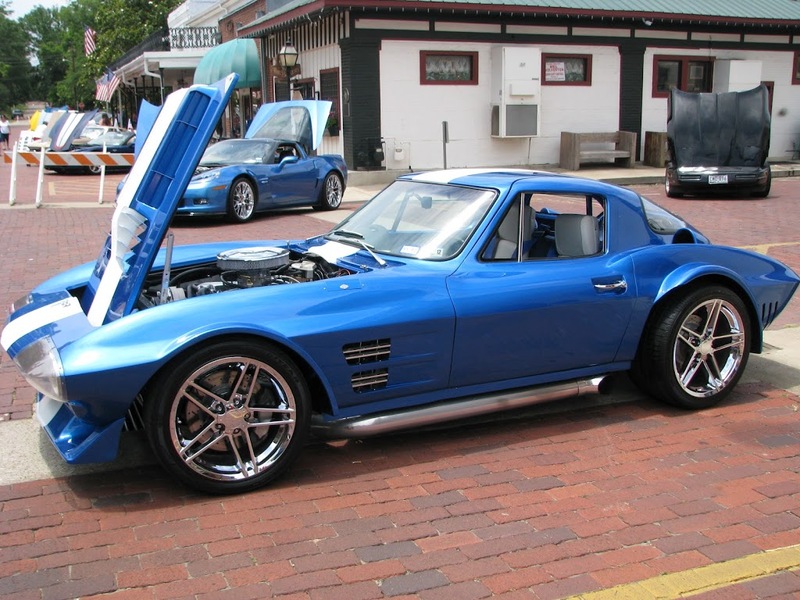 Last weekend downtown Jefferson TX was the site for the 2nd Annual Big Cypress Corvette Classic Car Show. There were some gorgeous cars represented during the show and we saw plenty more Corvettes all over town that weren’t in the car show. One special car that came was one of the rarest Corvettes, a 1963 Grand Sport, in replica form from ProClassics Restoration in Texarkana. It was very unique and David really liked it, I think there was a bit of Corvette envy going through his mind when he was looking at it. Our guests that weekend both had beauties, one was an older model in a brilliant red and the other was newer in pristine black. Both had a wonder time Friday night cruising out to Caddo Lake to eat dinner at the River Bend restaurant. Saturday all 75 cars entered in the competition were polished and lining both sides of the streets in downtown Jefferson. We really had a great time ogling the Corvettes. We were impressed by all the little details the cars had including the signatures on the engines and under the hoods. I wonder what that was about. And the car that was owned by I presume a firefighter was super special with the emblem on the engine cover and the painted old time horse drawn fire engine under the hood to the cutest little Dalmatian puppy statue peeing on the tire. Now that is pride of ownership! I took so many pictures that I decided to make them into a video for everyone to enjoy. Since the Winners were posted on Facebook, I thought I’d also add them here. Next June we are certain the Corvette Show will be bigger and better. Plan to be here in Jefferson TX for the 3rd Annual Bid Cypress Corvette Classic Car Show!